B and C. In the southern Indian ocean, in the Iles Eparses, at EUROPA island SC Mills (EPHE, CRIOBE); R Beldade (CRIOBE) and their collaborators S Killen (Glasgow University), G Bernardi (UC Santa Cruz) and Isabelle Cote (Simon Fraser) are preparing manipulation experiments aboard the Marion Dufresne investigating the potential for metabolic and neuroendocrine acclimation to climate change (elevated temperature) on the skunk anemonefish, Amphiprion akallopisos. D. SC Mills happy after 4 months of planning that her mobile fish husbandry set-up for the HOPE TO COPE project (TAAF) is perfect. The photos presented in this edition of 'Photo of the Month' were taken in the Indian Ocean, from the Îles Éparses, where Suzanne Mills, Ricardo Beldade and their colleagues from the University of California at Santa Cruz, Glasgow University and Simon Fraser University are working to better understand how populations will cope in response to climate change and to determine what measures need to be put in place to improve the chances that populations will survive. 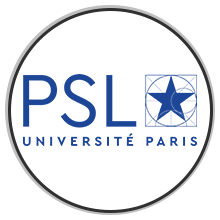 The Îles Éparses were selected for this study because of their pristine state as well as for their historic exposure to elevated sea surface temperatures along a latitudinal gradient, which provides a perfect stage on which to address vanguard questions related to environmental stressors and biodiversity management. This work is part of the Hope to Cope project. Reason for Hope : Acroporid corals in the Gambiers (French Polynesia). 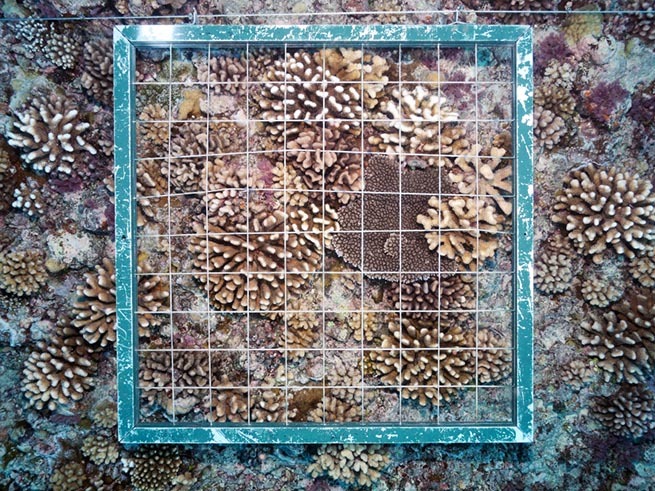 In many places around French Polynesia and the Pacific, acroporid corals used to be the foundation of coral reefs. Their spectacular structures were home to extraordinary biodiversity, including hundreds of species of fish and invertebrates. 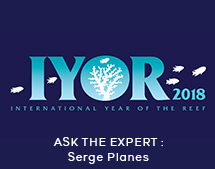 In some places, acroporid coral cover could exceed 95%. However, warming waters and an increase in powerful storms have resulted in the extensive bleaching and in the ultimate death of many of these important coral reef ecosystems. Today, sadly, many once-vibrant reefs are only a fragment of what they used to be. 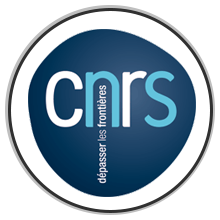 The Reef Services team, currently conducting research in the Gambiers, French Polynesia, have reason for hope. In the photo above, we see a very healthy acroporid reef, with exceptional cover and a diversity of fish and other animals to match. Reefs like these might provide important refuges for the ongoing persistence of coral reefs of the future. 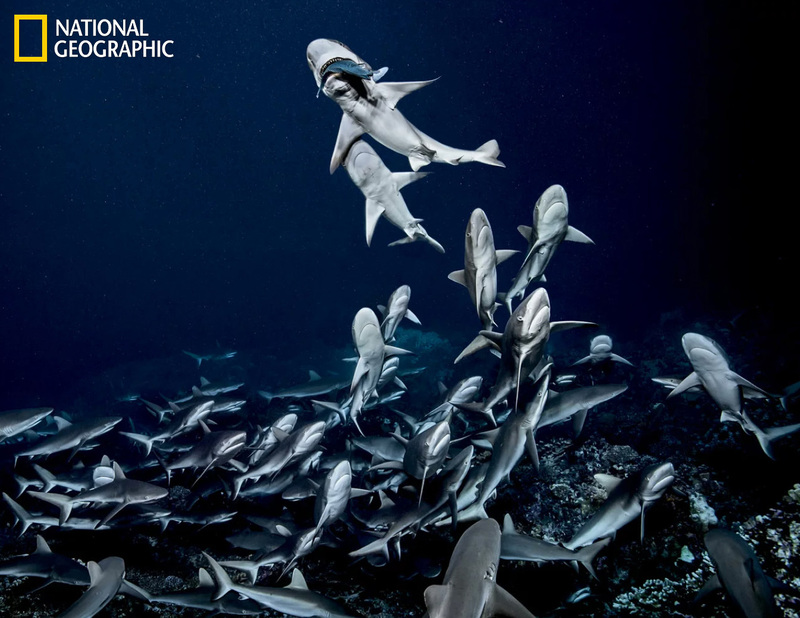 At night gray reef sharks hunt in a pack in the south channel of Fakarava Atoll, in the Tuamotu Archipelago (French Polynesia). photographer | Laurent Ballesta | National Geographic. The May 2018 issue of National Geographic Magazine features Laurent Ballesta's photographic work on the Fakarava Pass during the GOMBESSA II and IV projects. 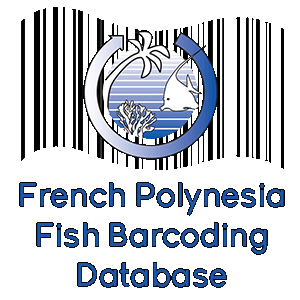 In collaboration with CRIOBE's Johann Mourier since 2014, this project has tried to unravel the mystery of the night hunting strategies used by more than 700 gray sharks living in the southern channel of Fakarava Atoll, in French Polynesia's Tuamotu archipelago. This chapter in the GOMBESSA project follows the grouper mystery that investigated the grouper spawning aggregations in June and July. Visit National Geographic magazine to see more extraordinary images and to read Ballesta’s first-hand account of this unique experience. Laurent Ballesta has published a full account of his team's experiences at Fakarava Atoll in a two-book set called 700 Sharks Into the Dark. It is available on Amazon. This picture of the soft coral Palythoa heliodiscus was taken at night at 15m depth in the St Etienne Hole, Tahiti, French Polynesia. This coral is actually a little colony of zoanthaires. They can be found across the entire Indo-Pacific , attached to rocks. It rapidly retracts when disturbed. Be careful not to touch this soft coral because while this coral is certainly beautiful, it is known for having a high concentration of palytoxin, a powerful marine toxin that was discovered in 1961 in Hawaii. 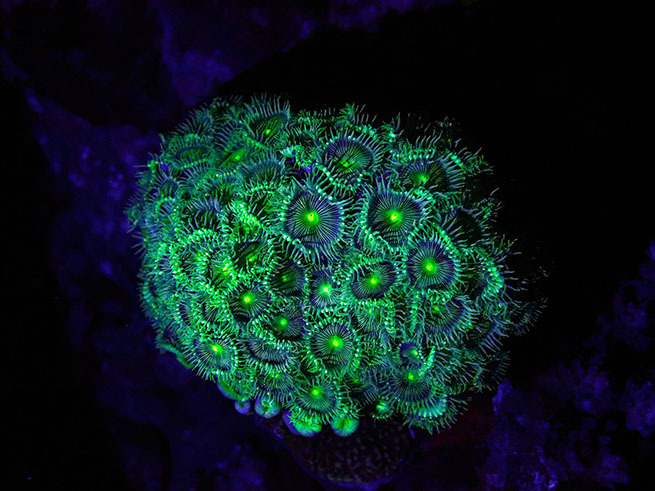 Here illuminated by UV light, it displays an amazing fluorescence. 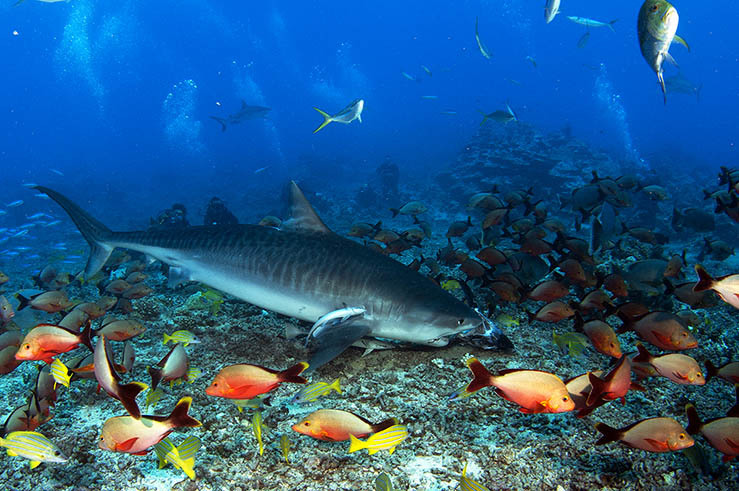 Is shark-feeding about to be banned in French Polynesia ? December’s ‘Photo of the Month’ shows a tiger shark grabbing the bait before the eyes of half a dozen thrilled divers at White Valley, a popular shark-feeding spot in Faa'a, Tahiti. Shark feeding is a popular activity for recreational divers who want to get a closer look at these majestic and often elusive animals. While this activity is still quite popular on the outer reef slopes of Tahiti and Moorea, its practice is highly controversial. On the one hand, it generates significant benefits for the local economy and demystifies the shark to the general public. On the other hand, it remains a risky activity for divers (accidental bites) and can alter the natural behaviour of sharks who often become sedentary and reliant on this regular source of food. Finally, shark-feeding can rob the ecosystem of the beneficial effects derived from the natural behaviour of this super-predator, who now spends much of its time waiting for the free food handouts at shark-feeding sites. Since 2005, the CRIOBE has studied the impacts of this controversial activity, with early results suggesting that shark-feeding might actually be a sustainable activity if it is properly managed. 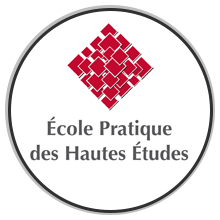 Article LP 2200-1 of the new environment code (JOPF of October 5, 2017) seeks to prohibit this practice in French Polynesia. Pending the final approval of this reform, shark feeding is currently still allowed outside of the lagoons at a distance of at least one kilometre from the passes. What happens on land matters to the sea. View from Oponohu Bay before and after heavy rains. 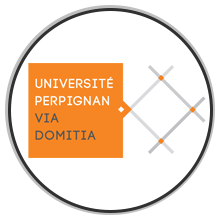 Credit : Lauric Thiault. What happens on land matters to the sea. 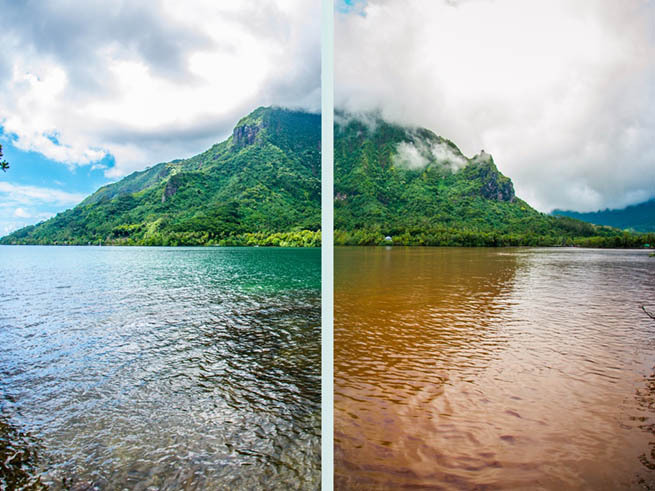 September’s Photo of the Month presents Opunohu Bay, Moorea, before and after a heavy rain event. This sequence was taken as part of a recent study conducted by CRIOBE’s researchers who - for the first time – accurately described the sediments and mapped sedimentation rates for Opunohu Bay. 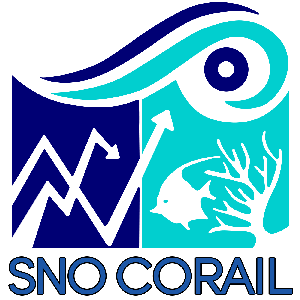 Coral cover recovers at record rates in Moorea ! Located on the North West coast of Moorea, French Polynesia, the Tiahura area has been monitored by scientists since the 1970s. 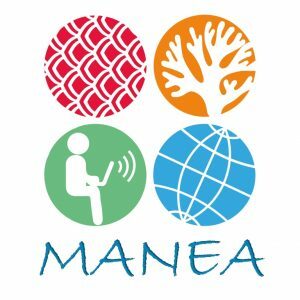 Here, the CRIOBE Coral Observation Service (SO CORAIL) team regularly monitors coral recovery, among other ecological variables. The coral reefs in the upper slope of Tiahura were impacted heavily by cyclone Oli (2010) and by an invasion of the Acanthaster planci sea star (2007-2010). Prior to these disturbances, the coral reefs were highly diverse and were relatively dense, with a coverage of 50% (2006). 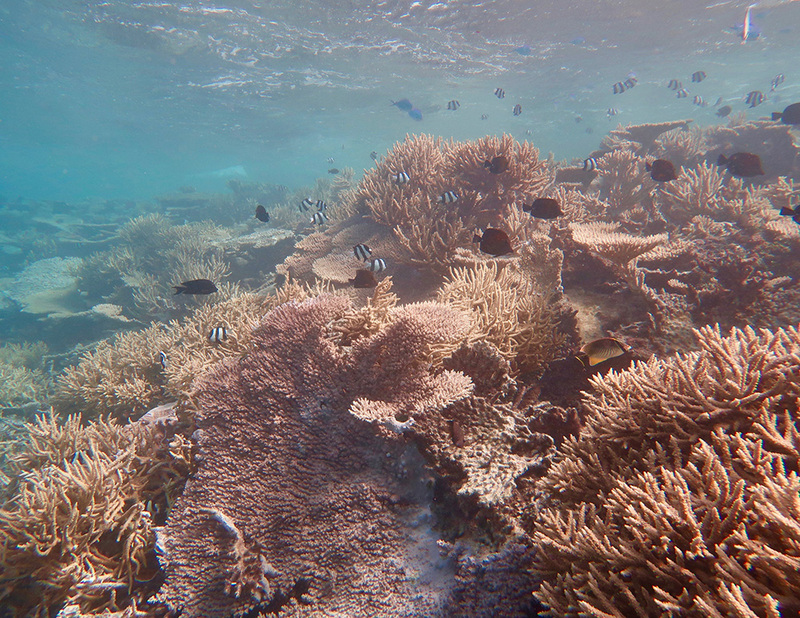 In 2010, the SO CORAIL team surveyed these reefs post-disturbance, and found that reefs had only recovered by 2%. However, recent monitoring has yielded some very encouraging results. 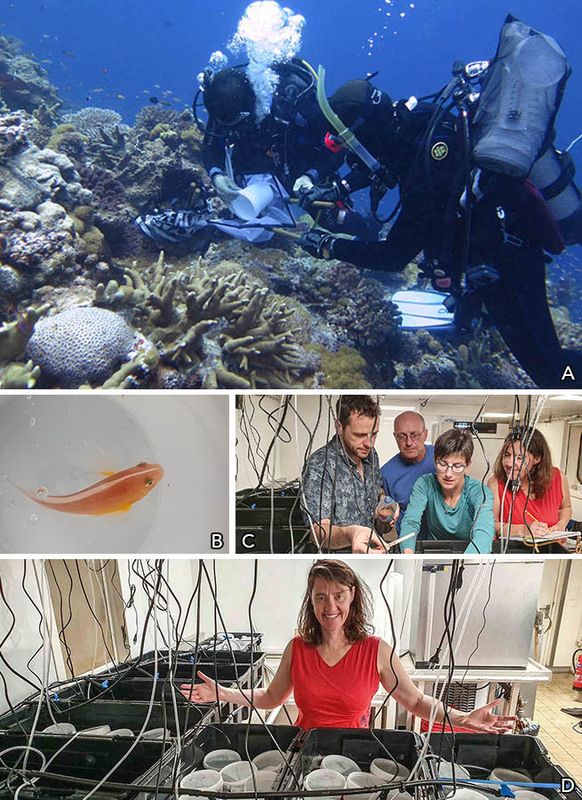 Coral cover is now measured at nearly 70% (mean value over 3 replicates) and the data indicates that coral in the genus Pocillopora are now dominating the area - representing 79% of the upper slope (compared with 33% in 2006).